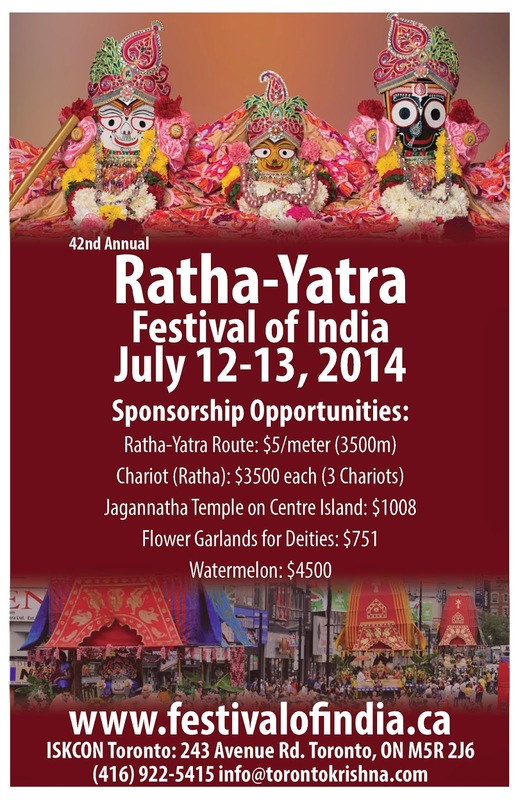 Ratha-Yatra Sponsorship and Donation Opportunities ~ The Toronto Hare Krishna Temple! 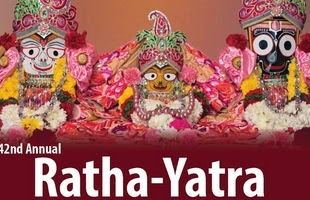 The 3500m route from Yonge and Bloor down to the waterfront represent's Lord Jagannatha's (Krishna's) symbolic journey from Dwarka to Vrndavan. Help make this journey possible by sponsoring a portion of the route for $5/m. Over 30,000 plates of free prasadam (sanctified vegetarian food) are distributed during this festival. This requires an immense amount of bhoga (ingredients) as well as supplies like plates and cutlery. Please contact Satyabhama devi dasi at satyabhama@torontokrishna.com for more information about prasadam related sponsorship. You can also sponsor flowers, garlands, chariots and more! Some details can be found on flyer above, please contact Satyabhama devi dasi at satyabhama@torontokrishna.com for more information. Of course general donations of any amount towards the festival are always accepted!